How To Get Advertisers To Accept Your Low Traffic Blog! 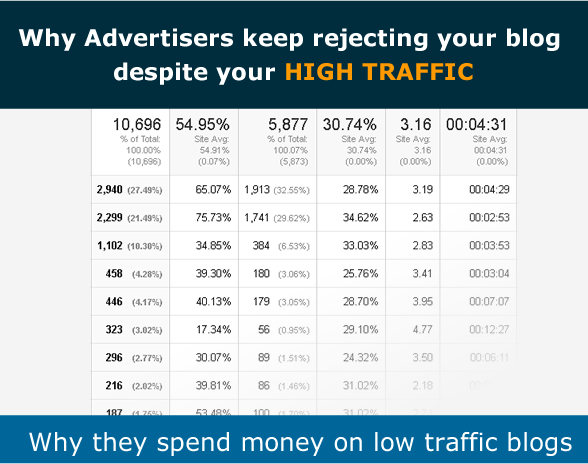 →How To Get Advertisers To Accept Your Low Traffic Blog! One of the ways to make money with your blog or website is to get paid by advertisers to place a banner on your site or create a review post. While banner advertising may not generate any huge earnings, sponsored posting can fetch you higher earnings than you may think. If you post more regularly, you may have 4 sponsored posting business per month for $500 each. That boils down to $2000. This looks good for many of us. NB: I have created a post on 15 ways bloggers make money. Click here for the article. We have generally been made to believe that if you don’t have 1000s of readers per day, you can only settle for peanuts or nothing. That’s not correct! Having 1000s of visitors per day doesn’t directly translate to money. I have come across blogs with huge traffic that constantly suffer from advertisers rejecting them. There are also blogs with 200 readers or less a day that stand out and attract advertisers big time. That points to the fact that the secret is not all in traffic. There are some few points you might not have known that I have revealed in my free report. In this report, I point out 3 things that many bloggers neglect. These are the key points most sponsors pay attention to. I have also provided a solution if your blog lacks these crucial 3 ingredients. If you don’t know about this, you will keep missing business so I encourage you grab this free report now. Enter your First Name and Email below and you will be taken to the download page. This free report is not about how to increase traffic. There is a lot of stuff out there on that. It is rather on how to dig out the real value of your current traffic. You can create a very popular blog in just 90 days. I have written an article that shows you just how. Check out this article and follow the simple steps. Whether you are getting 100 visits per day or 1000s or daily readers, your blog or website can still generate enough money to pay your bills and maybe buy a new laptop. The problem is what we have been made to believe. This has generally veiled our ability to see the power our little traffic has to pull money. Success is hidden in action! You cannot succeed by mere wishes. Success is the result of action. You must do the right things at the right time to succeed. Most of us have downloaded reports that have not taken us somewhere. As a matter of fact, there are hundreds of this reports wasting somewhere on your Hard Drive. Purchasing hot ebooks or downloading fee reports like this one does not in any way take you closer to a sale. You have to take necessary actions as recommended in the books you download. That’s what makes people to succeed. In this report, I show you something on your Google Analytics report. I also provide actionable tips how to boost these figures and make your blog attractive to advertisers. If you don’t follow these VERY EASY steps, this will be just another wasting report. Download your free copy now, take action and possibly see positive results. I’ll be glad to hear your general opinion about this report. Please keep the content secret. Don’t reveal it in the comment box. You are really a great thinker and creative man. The way of your presenting content or tips and tricks are just amazing. you have got the ideas what people are thinking and which type of problem they are facing, and according to their problem you are sharing solutions or advices. Yeah, you are correct! I visit each time here because i love to read the informations you share. Each time i get something special and so i love to be here on this blog. It looks awesome! However, I’ll take more time on it. Do you use skype? Just filled the form and will check the email after sometime and I’d surely check your free report soon. Wow! Amazing and very deep information today i got from here. Actually Sir i am Truely saying i tried approx 2-3 time to get Direct advertisement for my blog , but 1 time got approval and 1 time they said no. Thanks Enstine for the inspiration and for the FREE report which I downloaded. (Awaiting the email) I have been wanting to start off with at least one advertiser by summer. This has inspired me to go after it and just do it! Thanks for stopping by and I hope this report will give you some useful information to start with. Great tips for the bloggers. I liked especially the one to decrease bounce rate. Shall follow your tips for my blog improvement. Thanks Enstine. Waw, You shared an amazing article, we all need this one. I like your way to create a link with another title with color box. Interlinking helps lot to maintain bounce rate. Website theme matter lot, Soon I am going to upgrade my blog with a good theme so I could get easily advertiser to my blog. It is a fine energetic booster article for the bloggers. Really you have explained the ways very nicely. Once again hats-off for your awesome guide. Thank you very much! I think once you have what the advertisers are looking for then they will spend the money with you. You have mentioned some awesome tips on how to get advertisers. I like your promotional style! You literally draw a lot of people in. At least me LOL… but you’re right, you can have 1000’s of viewers, but yet making little to no sales. Once I get home I will definitely check out your free report once I get home and settled tonight! Thanks for sharing! sherman smith recently posted…How Important Is Keyword Density To Your Blog? I have signed up for the free report. I’m a fan of your creative ways to generate income. Interested to see what you have in store since you mostly see you need many daily visitors to generate anything worth talking about. I hope all is going well. Take care Enstine! Steven Wilson recently posted…Are You Using The Plugin That Rules All Other Plugins? hello enstime. thanks for sharing this post. i too fall under these kinda categories of mere wishing with mouth but nont taking action. i have read many success blog about how the they succeed but……well, i’d like to ask. is there any hidden secret to success?. Very helpful and informative article indeed, it seems that it will help a lots of people around the world.Really want to check it out your free report. Getting paid posts is indeed a tough task and I have been trying to get since long , but failed always . So let’s see what you are giving in your free report . I hope it will work . If anyone can teach people how to get in front of advertisers even when they’re traffic isn’t as good as they had hoped that would be you. I have no doubt you’ve jam packed this one with goodies. I personally don’t want advertisers on my blog, I know ridiculous right! I turn them down right and left but that’s not what I want to focus on. Another great share and best of luck to everyone who picks up a copy. Good to see you here today and thanks for the contribution. I’m sure you have solid personal reasons for not accepting advertisement on your blog. For a blog like yours, that could be a lucrative way to raise some money – at least for the blog to sponsor itself, take care of AWber bills and many more ;). Great post and the title of the post is super attractive. Looking at the title I wondered if this was really possible and I landed up on your blog to read the article, even got the free report. Loved it actually! Super packed with actionable information and the insight to the Google Analytics is just wow! We do know these things but often tend to ignore these and give more of our precious time to other things, which might not be as important. But I feel really good at the way you explained step by step about the Sessions, Bounce Rate and how they affect advertisers. Enstine Muki recently posted…Influencer Marketing with GuestCrew ~ New Feature For More Traffic! Thanks for the report. I just downloaded it. You have really got the best information covered in your report, I just downloaded it and with what I have learnt already,it is really awesome..
All I can say is thank you for sharing this report with us !! I enjoyed reading your Report and I agree with all of your points. Would you like to share where we can find those advertisers? Is there any site where you find advertisers for a Paid Review ? Brijesh Gohil recently posted…How To Choose Best Laptop For Yourself ?